Increase's sister Lucy married fellow settler John Dyer. Their uncle was fellow settler Noah Merritt. Susannah's ancestry can be seen on her father Ezra Penniman's page. 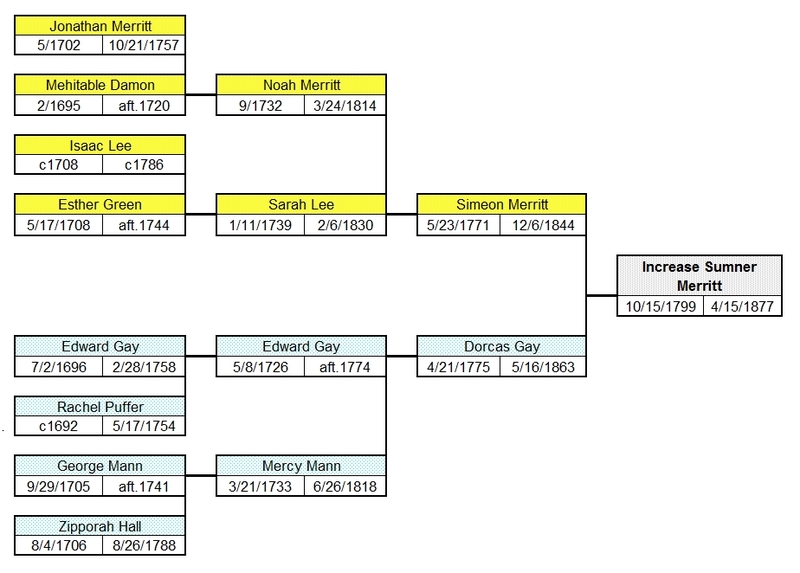 Descendants of Increase Sumner Merritt. 1. INCREASE SUMNER7 MERRITT (SIMEON6, NOAH5, JONATHAN4, JOHN3, JOHN2, HENRY1) was born 15 Oct 1799 in Templeton MA, and died 15 Apr 1877 in Templeton MA. He married SUSANNAH PENNIMAN 14 Sep 1822 in Templeton MA, daughter of EZRA PENNIMAN and LOUISA EAGER. She was born 09 Nov 1799 in Gardner MA, and died 21 Aug 1862 in Templeton MA. 2. i. SIMEON8 MERRITT, b. 12 Mar 1823, Gardner MA; d. 19 Dec 1882, Ashburnham MA. 3. ii. EZRA MOORE MERRITT, b. 02 Mar 1825, Gardner MA; d. 12 Mar 1899, Ashburnham MA. 4. iii. SUMNER LINCOLN MERRITT, b. 25 Feb 1827, Athol MA; d. Aft. 1880.
iv. DORCAS SARAH J MERRITT, b. 15 Nov 1828, Athol MA; d. 01 Nov 1912, Chelsea MA. 5. v. CHRISTOPHER COLUMBUS MERRITT, b. Sep 1830, Gardner MA; d. 02 May 1909, Springfield MA. 6. vi. DULCENAH W MERRITT, b. 01 Jan 1835, Gardner MA; d. 14 Sep 1912, East Templeton MA. vii. CORDELIA MERRITT, b. 21 Mar 1837, Templeton MA; d. Aft. 1865. 7. viii. MARCUS MORTON MERRITT, b. 01 Apr 1839, Templeton MA; d. Bet. 1910 - 1920. 8. ix. MARTIN VAN BUREN MERRITT, b. 06 Jan 1841, Templeton MA; d. 02 Jul 1912, Dedham MA. x. SALOME MERRITT, b. 21 Feb 1843, Templeton MA; d. 07 Nov 1900, Somerville MA. 2. SIMEON8 MERRITT (INCREASE SUMNER7, SIMEON6, NOAH5, JONATHAN4, JOHN3, JOHN2, HENRY1) was born 12 Mar 1823 in Gardner MA, and died 19 Dec 1882 in Ashburnham MA. He married (1) ABBIE E ?. She was born Feb 1836 in MA, and died Aft. 1910. He married (2) EUNICE TAYLOR 13 Aug 1846 in Ashburnham MA. She was born Abt. 1824 in MA, and died 03 Dec 1872 in Ashburnham MA. i. MARY ABBIE9 MERRITT, b. Abt. 1859, MA; d. Aft. 1880.
ii. DAUGHTER9 MERRITT, b. Abt. 1847, Ashburnham MA; d. 26 Aug 1847, Ashburnham MA. iii. ELLEN A MERRITT, b. 31 Oct 1851, Ashburnham MA; d. 15 Dec 1851, Ashburnham MA. 3. EZRA MOORE8 MERRITT (INCREASE SUMNER7, SIMEON6, NOAH5, JONATHAN4, JOHN3, JOHN2, HENRY1) was born 02 Mar 1825 in Gardner MA, and died 12 Mar 1899 in Ashburnham MA. He married ADALINE M SAWYER 11 Nov 1855 in Fitchburg MA. She was born Abt. 1830 in Westminster MA, and died 14 Aug 1886 in Ashburnham MA. i. CARRIE L9 MERRITT, b. 08 Nov 1861, Ashburnham MA; d. 10 Jan 1866, Ashburnham MA. 4. SUMNER LINCOLN8 MERRITT (INCREASE SUMNER7, SIMEON6, NOAH5, JONATHAN4, JOHN3, JOHN2, HENRY1) was born 25 Feb 1827 in Athol MA, and died Aft. 1880. He married LAURA A HODGKIN. She was born Abt. 1838 in VT, and died Aft. 1880.
i. ALICE H9 MERRITT, b. Abt. 1856, VT; d. Aft. 1870.
ii. NELLIE L MERRITT, b. 16 Aug 1860, VT; d. Aft. 1880. 5. CHRISTOPHER COLUMBUS8 MERRITT (INCREASE SUMNER7, SIMEON6, NOAH5, JONATHAN4, JOHN3, JOHN2, HENRY1) was born Sep 1830 in Gardner MA, and died 02 May 1909 in Springfield MA. He married ELVIRA JOSEPHINE PARKER 13 Oct 1860 in Templeton MA, daughter of OSCAR PARKER and SOPHRONIA JACKSON. She was born 26 Nov 1837 in Gardner MA, and died 26 Dec 1883 in Springfield MA. 9. i. JOSEPHINE MAY9 MERRITT, b. May 1861, Winchendon MA; d. Aft. 1940. 10. ii. HARRIET S MERRITT, b. 05 Nov 1863, Springfield MA; d. Aft. 1930.
iii. HENRY ROMEO MERRITT, b. 24 Dec 1869, Springfield MA; d. 22 May 1911, Springfield MA; m. GEORGIA MERRILL, 27 May 1890, Springfield MA; b. Abt. 1870.
iv. CHARLES JUNIUS MERRITT, b. 21 Feb 1874, Springfield MA; d. 12 May 1905, Springfield MA. 6. DULCENAH W8 MERRITT (INCREASE SUMNER7, SIMEON6, NOAH5, JONATHAN4, JOHN3, JOHN2, HENRY1) was born 01 Jan 1835 in Gardner MA, and died 14 Sep 1912 in East Templeton MA. She married ELBRIDGE M COLEMAN 10 Jan 1854 in Templeton MA. He was born Aug 1826 in Templeton MA, and died 21 Feb 1903 in Templeton MA. i. HATTIE JANE9 COLEMAN, b. 26 Sep 1855, Templeton MA; d. Aft. 1920.
ii. CHARLES HENRY COLEMAN, b. 12 Sep 1862, Templeton MA; d. Aft. 1920; m. MAUDE MAY NOE SWEETSER, 21 Jan 1910, Templeton MA. 7. MARCUS MORTON8 MERRITT (INCREASE SUMNER7, SIMEON6, NOAH5, JONATHAN4, JOHN3, JOHN2, HENRY1) was born 01 Apr 1839 in Templeton MA, and died Bet. 1910 - 1920. He married EMMA F KIMBALL 16 Sep 1874 in VT/Chelsea MA. She was born Abt. 1848 in VT, and died Aft. 1920. 11. i. MARION KIMBALL9 MERRITT, b. 16 Feb 1876, Chelsea MA; d. Bet. 1930 - 1940.
ii. ALICE SALOME MERRITT, b. 18 May 1877, Chelsea MA; d. Aft. 1902; m. CHESTER M COLEMAN, 06 Oct 1902, Framingham MA. 8. MARTIN VAN BUREN8 MERRITT (INCREASE SUMNER7, SIMEON6, NOAH5, JONATHAN4, JOHN3, JOHN2, HENRY1) was born 06 Jan 1841 in Templeton MA, and died 02 Jul 1912 in Dedham MA. He married ANNA CHRISTINA M B SCHAADT 05 Jun 1875 in Ipswich MA. She was born Dec 1852 in Germany, and died Aft. 1940.
i. HELEN SAWYER9 MERRITT, b. 02 Nov 1876, Chelsea MA; d. Aft. 1910. 12. ii. INCREASE SUMNER MERRITT, b. 15 Jan 1880, Dedham/Chelsea MA; d. Aft. 1942.
iii. GEORGE EDWIN MERRITT, b. 16 Jul 1883, Dedham/Boston MA; d. Aft. 1940. 9. JOSEPHINE MAY9 MERRITT (CHRISTOPHER COLUMBUS8, INCREASE SUMNER7, SIMEON6, NOAH5, JONATHAN4, JOHN3, JOHN2, HENRY1) was born May 1861 in Winchendon MA, and died Aft. 1940. She married WILLIAM RICE NEWHALL 18 May 1892 in Springfield MA. He was born Dec 1860 in MA, and died Bet. 1910 - 1920.
i. HARRIET10 NEWHALL, b. 21 Feb 1893, Westfield MA; d. Aft. 1920.
ii. PARKER NEWHALL, b. 08 May 1894, Wilbraham MA; d. Aft. 1940; m. LUCRETIA ? ; b. Abt. 1893, CT; d. Aft. 1940.
iii. SIDNEY MERRITT NEWHALL, b. 21 May 1896, Wilbraham MA; d. 09 Oct 1978, Lee FL. iv. ELIOT MARTIN NEWHALL, b. 15 Sep 1899, MA; d. Aft. 1940; m. MARION S ? ; b. Abt. 1900, MA; d. Aft. 1940. 10. HARRIET S9 MERRITT (CHRISTOPHER COLUMBUS8, INCREASE SUMNER7, SIMEON6, NOAH5, JONATHAN4, JOHN3, JOHN2, HENRY1) was born 05 Nov 1863 in Springfield MA, and died Aft. 1930. She married FRED L HOWARD 07 Jun 1893 in Springfield MA. He was born Jul 1854 in MA, and died Aft. 1910.
i. SUMNER MERRITT10 HOWARD, b. 09 Nov 1896, Worthington MA; d. 27 Jan 1986, Newton MA; m. KATHERINE I ? ; b. Abt. 1896, ME; d. Aft. 1930. 11. MARION KIMBALL9 MERRITT (MARCUS MORTON8, INCREASE SUMNER7, SIMEON6, NOAH5, JONATHAN4, JOHN3, JOHN2, HENRY1) was born 16 Feb 1876 in Chelsea MA, and died Bet. 1930 - 1940. She married WILLIS A HINMAN 15 Apr 1908 in Everett MA. He was born Abt. 1876 in NY, and died Aft. 1940.
i. SARAH A10 HINMAN, b. Abt. 1909, NY; d. Aft. 1930. 13. ii. MARION K HINMAN, b. 27 Jul 1910, Clyde NY; d. Aft. 1940.
iii. HELEN M HINMAN, b. Abt. 1915, NY; d. Aft. 1940.
iv. HAROLD W HINMAN, b. Abt. 1918, NY; d. Aft. 1940. 12. INCREASE SUMNER9 MERRITT (MARTIN VAN BUREN8, INCREASE SUMNER7, SIMEON6, NOAH5, JONATHAN4, JOHN3, JOHN2, HENRY1) was born 15 Jan 1880 in Dedham/Chelsea MA, and died Aft. 1942. He married (1) LILLIAN EARLE 12 Aug 1903 in Gloucester MA. She was born Abt. 1880 in Gloucester MA, and died 06 Jun 1905 in Boston MA. He married (2) MARY ALBERTA FARRELL 10 Oct 1906 in Boston MA. She was born Abt. 1887 in Canada, and died Aft. 1940.
i. HAZEL A10 MERRITT, b. Abt. 1913, MA; d. Aft. 1930. 13. MARION K10 HINMAN (MARION KIMBALL9 MERRITT, MARCUS MORTON8, INCREASE SUMNER7, SIMEON6, NOAH5, JONATHAN4, JOHN3, JOHN2, HENRY1) was born 27 Jul 1910 in Clyde NY, and died Aft. 1940. She married CHARLES PETERS 27 May 1933 in Steuben IN. He was born 02 Feb 1911 in Battles Creek MI, and died Aft. 1940.
i. CHARLES11 PETERS, b. Abt. 1934, MI; d. Aft. 1940.